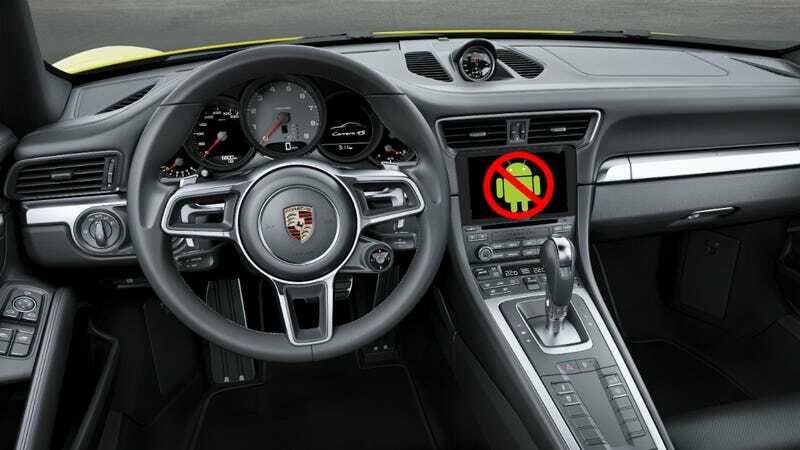 If there’s anything to be learned from the recent media firestorm surrounding Porsche’s decision not to offer Android Auto in its flagship sports car, it’s this: transparency is the only way forward for the connected car. The controversy erupted after Motor Trend reported on Porsche’s decision to pass on Android Auto after discovering Google wanted access to a range of engine data from the company’s latest 911. Things like vehicle speed (which Apple’s CarPlay uses to determine if certain features are safe to operate) is logical enough, but engine revolutions, throttle position, coolant and oil temperatures were apparently a step too far. At least for Porsche. Oddly, Porsche’s corporate siblings at Audi, Bentley, Seat, Škoda, and VW are beginning to offer Android Auto integration. Which begs the question: why is one automaker within the massive Volkswagen Group conglomerate not okay with Google’s data collection, while it’s stablemates – along with over 30 other automakers – are completely on board? That’s yet to be answered. Google sought to clarify what information it gathers in the wake of the story, saying that it does “not collect the data the Motor Trend article claims such as throttle position, oil temp and coolant temp.” A Google spokeswoman goes on to state that users opt-in to share information with Android Auto to “improve their experience,” but doesn’t expand on exactly how it does so, beyond hands-free control and using the vehicle’s antenna for more accurate GPS transmission. This lack of clarity in its clarification is the exact opposite of what the connected car space needs, both for automakers and its customers. Transparency about what companies are collecting, what they’re doing with that data, and a means to opt-out shouldn’t just be best practices – it should be assumed. There can be no ambiguity. Automakers and their tech partners have to disclose clear terms, in plain language, to ensure a nuanced understanding by the public of what their vehicles are doing. Obscuring any of that, even for a moment, will do irreparable damage to a nascent industry that has the potential to offer greater convenience, untold functionality, and save lives in the process. It also happens to have a projected worth at least $40 billion by 2020. Automakers know what’s at stake. By letting the Trojan Horse of Google (and, to an extent, Apple) into its products, automakers are sacrificing a modicum of control to provide the features both tech companies and their automotive partners are betting consumers want. But any illusion that the latest infotainment offerings are simply a way to get maps, messaging, and music into cars is naive at best. It’s part of a much larger play by the titans of the tech industry to expand into one of the largest, most influential markets since mobile computing. Automakers need partners with shared goals, and if there’s any question about the validity, security, and privacy of these systems, the potential of the connected car will wither before it even has a chance to bloom.